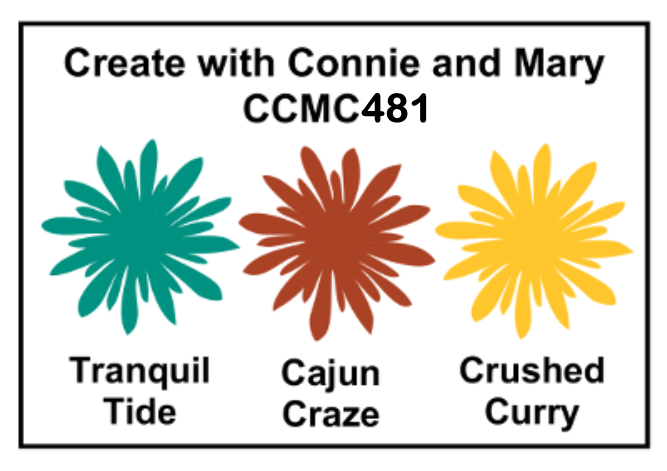 Back again with another fun color challenge at Create with Connie and Mary! The trees are finally starting to show a change of color here. It's a slow progression, but still, it's starting! I'm getting excited! In honor of Mother Nature's glory, I decided to show my enthusiasm in the form of a card. I sponged all three colors on a piece of Whisper White card stock randomly. I then took my Tuxedo Black Memento ink pad and stamped the leaf from the Colorful Seasons stamp all over leaving a little space in between. 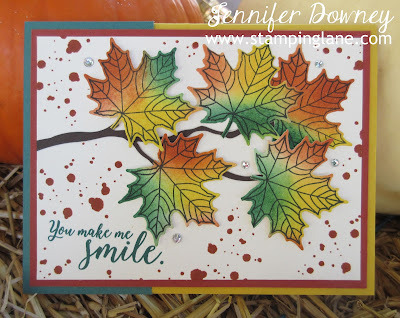 Then using the coordinating framelits, I die cut each leaf out. I added a die cut Early Espresso branch from the same framelit set. I know this isn't one of the colors this week, but sometimes you gotta bend the rules just a tad. ;) Some leaves are adhered flat and other's are popped up on dimensionals. I also used the splatter stamp from the Swirly Bird set to help fill in some of the white space. Can you find all 5 rhinestones I placed around the card for some visual interest? Oh Mother Nature, how you do make me smile this time of year! Happy Stamping!